For this month’s blog post, I would like to steer away from the subject of my research (botanical watercolors) and instead turn to a methodological issue in historical remaking. Between the 16th and 18th of this month, I was invited to participate in the Burgundian Blacks Collaboratory. For this workshop, experts from different fields joined forces to experiment with reconstructions of early modern black dyeing technologies based on a selection of historical recipes (Fig. 1). The workshop is part of the research for a collaborative exhibition project that will be on view at Museum Hof van Busleyden in Mechelen later this year, and an edited-volume-in-planning on the subject of “Burgundian Blacks.” For those who are interested in learning more about what we did during the workshop, there will be a series of blog posts from the participants, and I will add the links to this page as the posts appear. For now, I want to write about some thoughts on the method of learning from a “living source” using my own experience of the workshop. Fig. 1. Experts from different fields experimenting with different recipes in our temporary lab, which was a greenhouse on the farm De Kreake in Húns in Friesland. What is a “living source”? In her article, Timea Tallian proposed three groups of living sources that can help fill the gaps in understanding historical recipes: experts, masters, and practitioners. The definition of the three groups is more suggestive than hard-drawn. In general, “expert” refers to a person who conducts practical and/or scientific experimentation or reconstruction based on historical documentation. “Master” refers to a person who has acquired an art or craft through apprenticeship and continued to practice it for a long time. “Practitioner” refers to a person who has gained most knowledge from personal experience in making art/craft and self-motivated research into historical techniques. During the Burgundian Blacks Collaboratory, I was in the same group as Jo Kirby-Atkinson, former Senior Scientific Officer at the National Gallery in London and co-author of the seminal book Natural Colorants for Dyeing and Lake Pigments. Jo is, in every aspect of the term, an expert on natural colorants and materials, whereas I am a novice with no prior experience in working with natural dye and textile. While not strictly, the dynamic of my group resembles a historical workshop, with an expert/master showing the ropes to an apprentice. Our group was given three seventeenth-century recipes to decode, with two originally written in Dutch, but translated into English, and one in French. All three recipes yielded rich black dyes (Fig. 2), even though we had to compress the multiple-day dyeing-processes into only a few hours. Fig. 2. 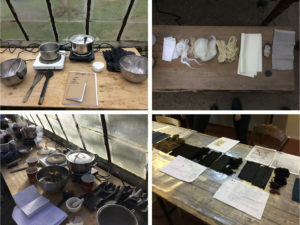 Top left: our equipment for the experiments; Top right: the different textiles we gathered before dyeing them black; Bottom left: in the middle of dyeing following the instructions of one of the Dutch recipes; Bottom right: final results of our experiments. 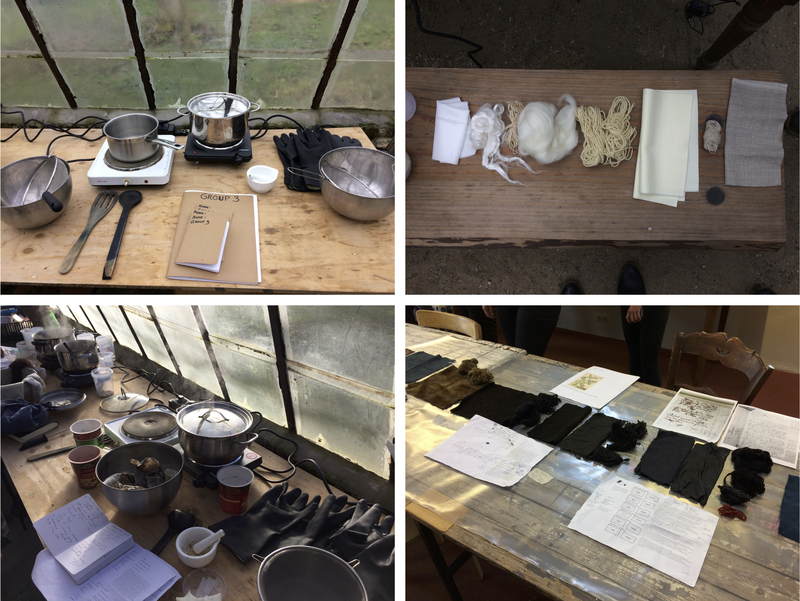 For three days, I followed Jo around, gathered and prepared the needed materials as she had instructed, and attentively listened to her explaining the reasons behind the decisions she made to follow or modify the recipes when dyeing our textile. Unlike many historians that start working with recipes by reading and interpreting the texts right away, I started by listening to and absorbing the knowledge of the expert/master. In fact, this has always been how I learned historical techniques, or any artistic techniques. When I was in art school, manuals and how-to guides were always part of the assigned readings for classes, but I seldom consulted them. Instead, I observed what the professors did during demonstrations and tried to replicate the processes and results. 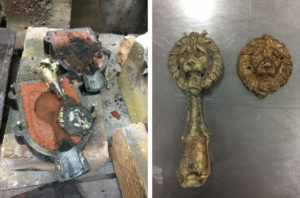 For my first lesson in historical remaking, I learned an eighteenth-century metal-casting technique (Fig. 3) through the step-by-step explanations from an Amsterdam-based silversmith and conservator. Similarly, I gained my knowledge in early modern printing (Fig. 4) by working alongside a master printer who learned the trade in a workshop. While historical recipes and instructions still play an important part in my research of these techniques, I do not usually read them until after I have some hands-on experiences. Fig. 3. Left: removing the lion head ornament from the casting flask; Right: the cast and the original lion head ornament. Fig. 4. Two process photos of printing with a hand press. How does learning from these experts affect my reading of historical recipes then? Does knowing the practical aspects of a technique help me understand the recipes better? Or does it prevent me from finding other possible interpretations of a recipe because I am conditioned by what the experts have shown me? Upon reflection of the workshop, I noticed that my take on the original source is, indeed, shaped by Jo. When going through the recipes afterwards, my mind replayed the steps we took to dye our textile black. Interestingly, the recipes became so straight forward. In the imagined laboratory, my mind automatically filled in the gaps in the recipes with the decisions and measurements Jo made during the workshop. She has taken all the guess work out of interpreting the recipes, and what I have is a very cleaned-up, and perhaps all-too-easy, version of the processes. However, I also noticed that I started to question some other things that are not necessarily directly related to the texts in the recipes we were testing, but to the broader historical contexts. For example, for one of the recipes we put linen and woolen materials in the same dye bath for the experiment. The linen came out more of a gray than black. Jo explained that in order for linen to get to the same level of blackness as wool, it would require a much longer time to mordant the fabric with alum. Historically and practically speaking, linen would not have been dyed with this particular recipe anyway because the cost of the overdyeing process (dyeing with multiple dye baths) would have been too expensive for the fabric. Such a recipe, thus, would have only been used for high quality material like wools and silks. These comments got me curious about the alum trade and the regulations of dyeing certain fabrics in the early modern period to which I have never paid attention before. To answer my own questions, I think that gaining the hands-on skills from an expert/master is beneficial to prevent me from getting caught up with words and sentences as a novice; instead, I can focus on connecting the technique of investigation to its larger historical and social context. Learning from these experts also makes me become more aware of the oral knowledge transfer in a workshop in addition to written recipes. As I am only at the beginning of working with historical recipes, there will be more opportunities to interpret and experiment with recipes for different materials and techniques without the aid of an expert. Much like an apprentice who would become a master, I think that I will eventually find my own perspective on working with recipes. The workshop was organized by Jenny Boulboullé (ERC Artechne Project, Utrecht University & University of Amsterdam) and Claudy Jongstra (textile artist), and prepared in collaboration with Natalie Ortega Saez (University of Antwerp) and Art Proaño Gaibor (Cultural Heritage Agency of the Netherlands). 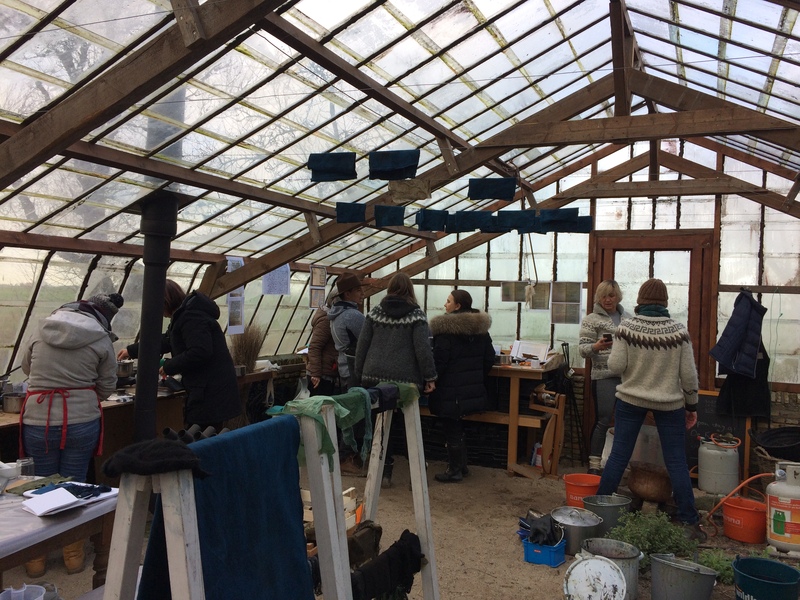 It was hosted by Claudy and her team in Húns in Friesland, The Netherlands, and received funding from the Museum Hof van Busleyden, the ERC Artechne Project, and Studio Claudy Jongstra. For more academic blogging on historical recipes and how historians have been studying them, see The Recipes Project, https://recipes.hypotheses.org/about. Timea Tallian, “Living sources: experts, masters, and practitioners,” in The Artist’s Process: Technology and Interpretation: Proceedings of the Fourth Symposium of the Art Technological Source Research Working Group, eds. Sigrid Eyb-Green, Joyce H. Townsend, Mark Clarke, Jilleen Nadolny, and Stefanos Kroustallis (London: Archetype Publications, 2012), 10. Jo Kirby-Atkinson, Martin van Bommel, and André Verhecken, eds., Natural Colorants for Dyeing and Lake Pigments: Practical Recipes and Their Historical Sources (London: Archetype Publications, 2014). Jenny was also part of our group; but due to her role as the organizer, she was much needed by other participants and thus I mostly worked with Jo on the hands-on aspect of the experiments during the workshop. The two Dutch recipes, translated by Hofenk de Graaff, are from the so called Haarlem Manuscript (Recepten-boek om allerlei kleuren te verwen […], Frans Hals Museum, fol. 313-l-l and 95/r/3l) from the second half of the seventeenth century (after 1669). The unpublished French recipe, transcribed by Jenny, is from the first half of the seventeenth century. She found it in the Archives of the Royal Society in London (Classified Papers III(1)). This technique is one of the investigations for the PhD project of Thijs Hagendijk. To learn more, see Thijs Hagendijk, “Learning a Craft from Books: Historical Re-enactment of Functional Reading in Gold- and Silversmithing,” Nuncius 33 (2018): 198–235. Alternatively, Thijs has also written a few blog posts on the subject, see, for example, “How to Read Early Modern Instructions for Gold- and Silversmiths,” https://artechne.wp.hum.uu.nl/how-to-read-early-modern-instructions-for-gold-and-silversmiths/.